There are numerous other similar discourses and writings of the Promised Messiah (on whom be peace) which draw our attention to our obligations; a matter that the world is currently in need of. This indeed is the teaching which when presented to the world astonishes them. When further features and details of Islamic teachings are explained their astonishment increases because on a general level non-Muslims have only been told by anti-Islam circles that Islam is an extremist faith which usurps rights of others. They refer to the practices of certain Muslim organisations as proof of this which unfortunately some Muslim organisations and people are perpetrating. Reality is unfolded when example of the Holy Qur’an, blessed model of the Holy Prophet (peace and blessings of Allah be on him) the Rightly Guided Khilafat e Rashida and other Companions (may Allah be pleased with them) is presented before the world. And when it is explained to them that the Promised Messiah (on whom be peace) was sent in this age with this teaching which Ahmadiyya Muslims try to disseminate as well as practice, the world takes note! Huzoor said he has observed that when the facts are expounded well it has a remarkable effect even on hardened detractors. Today Huzoor gave some details of how during Huzoor’s recent Irish tour Islamic teachings as explained by him during his Friday sermon and his address at a reception had positive effect on our guests in Galway. 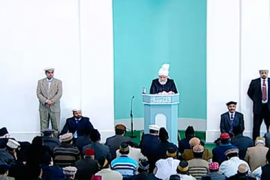 Huzoor said Ahmadis must have seen the broadcast of both the events on MTA. Furthermore Huzoor expounded Islamic teachings during interviews, talks with politicians and various well-versed people which were very well received. Huzoor said it is a good quality of the Irish that they openly express their positive or negative impressions, or if they do not like what they hear they keep their own counsel and do not praise something needlessly. The day after Huzoor arrived in Ireland the Jama’at there had organised a meeting at the Parliament House with some Parliamentarians including the Speaker of the national parliament. He is a very affable, open-minded and fair person. He said he knows about the Jama’at and values its works and said that although the Jama’at in Ireland was small it was very active. He has also personally experienced the efforts of the Jama’at in Africa. Huzoor gave him further information about Jama’at’s services in Africa including building hospitals, providing fresh water and other humanitarian works. What amazed the Speaker the most was that students in our schools in Africa were free to follow their own religious studies and were not bound to study Islam. He was surprised because Christian schools only teach the Bible. The Speaker also said that there are also Christian extremists in places but Christianity is never blamed for their acts. However, wrongdoing by any Muslim is attributed to his religion. Huzoor said he met many parliamentarians in a cordial atmosphere. Huzoor told them about the advent of the Promised Messiah (on whom be peace) in accordance with the prophecy of the Holy Prophet (peace and blessings of Allah be on him). Perhaps some politicians think that we like to keep ourselves separate from other Muslims. One question was put to Huzoor about the possibility of a platform to come together with our Muslim opponents for talks. Huzoor told them that we are always ready but the other side would not come. Huzoor explained that recently BBC planned a programme in which our young team member was invited to present his views and the other side was also invited. When they realised that an Ahmadi was going to be on the programme they refused to come. They know they do not have anything in response to our facts and arguments except lies. Huzoor said freedom of women was also discussed at the Irish Parliament which satisfied them. As regards sectarianism Huzoor informed them that sectarian divide in Islam was prophesised long ago and it was also the fundamental reason for the formation of Ahmadiyyat Jama’at. All the information was very well received. Five of the parliamentarians Huzoor met in Dublin also came to the Friday night reception in Galway which took place after the inauguration of the mosque. Other guests at the reception included five senators, members of the City Council, Chief Superintendent of Galway police, representative of the Bishop of Galway, who is also a Bishop in his own right, councillors, doctors, teachers, engineers, lawyers and others. The reception took place in a cordial atmosphere. An Irish politician said that the reception had uplifted his spirits and he was most impressed with Huzoor’s address. He said his view on Islam had completely changed. He said he has a friend who lives in Saudi Arabia and what he tells him about Islam was contrary to what was heard at the reception. Deputy Mayor of Galway County said that he was delighted to see various faiths coming together at the reception and he welcomed Islam Ahmadiyyat to Galway. Deputy Speaker of the national parliament said the reception was a lovely event and Huzoor’s address full of love and peace was most encouraging. He remarked that the message of love was most powerful. Another guest said that he was delighted to attend and would now take the message he received to others. Another guest said he was heartened to see people from different backgrounds coming together at the reception. He hoped that the reception would herald open-mindedness in Irish society so that everyone could live together in a positive atmosphere and an excellent future could be forged for Ireland. Huzoor remarked such is the teaching of Islam which the Jama’at spreads which even compels others to adopt it. Another guest remarked that undoubtedly people are frightened of Islam these days. However he felt that a lesson in religious tolerance was conveyed at the reception and Huzoor had made the guests aware of the Islamic teaching of love and peace which they found most assuring. He felt he had learnt a lot from the event. A guest felt that Huzoor had touched upon very significant matters in his address and everyone listening to Huzoor appeared impressed. He also remarked that Huzoor had mentioned the contradictions within the world of Islam today. Many guest expressed that they had found the true teachings of Islam at the reception. Many felt Huzoor’s address was replete with wisdom and touched hearts. They were impressed with Huzoor’s message of peace and his elucidation of Jihad and felt that the name of the mosque conveyed a message of harmony and accord. A councillor from Galway County wished for our message to resonate in the world and also wished that we become true ambassadors of the Holy Prophet (peace and blessings of Allah be on him). Huzoor remarked that here we see Christians not only extending respect to the Holy Prophet (peace and blessings of Allah be on him) but also praying for his message to be disseminated. A lady guest from the Education Foundation Dublin commended the name of the mosque and said that Huzoor’s address informed her about the status of Hazrat Maryam in Islam and how the Holy Qur’an has extoled her. She found this a charming aspect which should be told to all the Christians who are against Islam. She said she did not have any knowledge of Islam but was suitably impressed after listening to Huzoor’s address. A lady journalist guest said that she was not familiar with Islam but had spent the entire day at the mosque and had listened to the Friday sermon and also Huzoor’s address at the reception. She said she could only deduce from all this that Islam was a peaceable religion and she had experienced first-hand how affable Ahmadis were! A lady guest said that the only picture of Islam she had was the one fed by the media. However, after listening to Huzoor’s address she appreciates Islam’s peaceful message. A councillor said he used to think that all Muslims were as portrayed by the media but he was most impressed with Huzoor’s address, especially his message of peace and the motto of love for all hatred for none. He said he had no doubt that Ahmadis practiced what they preached. He felt the world was in great need of this message and needs to be told that there is a community within Islam which only spreads message of love. Huzoor said rather than simply be delighted by these comments we should realise that they increase our sense of responsibility. A lady councillor guest said that everyone was a little tense before coming to the reception but were assured after hearing Huzoor say in his address that the guests present would have some misgivings and apprehensions about Islam. A journalist guest remarked that Huzoor’s address was most thought-provoking. He also appreciated that Huzoor mentioned in his address that extremists have distorted the teaching of Islam. He felt Huzoor presented the fine teaching of Islam and said he had gained a lot of knowledge. He said he has known the Jama’at for eleven years but his appreciation of the Jama’at had further increased on the day. A member of the national assembly first expressed her thanks. She then said she was aware that Ahmadis were active members of society and how Ahmadi women give to charitable causes. Huzoor said it is good to be involved in charitable causes as this also introduces the Jama’at to others and opens further avenues of Tabligh. Chief Superintendent of Galway said that he was privileged to attend the reception. He remarked that he was very well aware that Islam Ahmadiyyat did not promote extremist views rather it taught religious tolerance. He said this was the reason the mosque was named after Hazrat Maryam. He said he was delighted that we had chosen Galway to build the mosque. In his capacity as a police officer he gave the Jama’at assurance of safety and protection! Huzoor said in Pakistan and other countries our mosques are vandalised and desecrated and all this is done in the name of Islam and here in the Christian world people are honoured that we have chosen their city to build our mosque. In places like Indonesia and Pakistan extremist actions are taken against us in the presence of and with the backing of police but police of a Christian country is giving as assurance of safety! While these people have adopted the morals that Islam teaches, Muslims have abandoned them! A seasoned politician who was first elected in 1999 and served as Minister for Communities and Rural Affairs from 2002 to 2010 and became the Minister for Social Protection in 2010 said that he had also attended the foundation laying ceremony of the mosque in 2010 and was delighted to be present at its inauguration. He said he was very impressed with the teaching of love and accord of the Jama’at and the Jama’at had proved that it worked on the ethos of its high objectives. He said he was most impressed with the way Jama’at held world religion conferences and brought different faiths together on one platform. The owner of a sound system company which had helped with work on the mosque said that he was a church going Catholic. However, he said he had felt a change in his life after coming to the mosque where he had found peace. He said he could never find God in the church but when he witnessed Huzoor lead Salat he found God in the mosque. He said he had taken the posture of prostration (sajdah) with Huzoor. He said although he does not know Salat, he repeated the Salat postures of Ahmadis and said that he prayed a lot for Ahmadis while in prostration posture. Press is a great source of Tabligh of the message of Islam. In Ireland TG4, an Irish language television channel with 5 million viewers gave the news of the mosque and showed Huzoor delivering his Friday sermon. A radio station RT Radio with one million listeners also recorded Huzoor’s Friday sermon and interviewed Huzoor and broadcasted it unedited. The RT Radio presenter asked Huzoor that while the motto of the Jama’at was love for all hatred for none, the opposite was going on in the Muslim world and did it not worry Huzoor? Huzoor replied to him that Islam teaches not to perpetrate cruelty, not to persecute others and this was the true Islam that we followed. And this was the basis of our motto love for all, hatred for none. Islam teaches us that there is One God and Muhammad is His Messenger and God is Lord of all the worlds and it is stated about the Holy Prophet (peace and blessings of Allah be on him) that he is mercy for all the worlds, for the entire mankind. Now, when the belief is that there is only One God Who nurtures and sustains all the worlds and there is one Prophet who is mercy for all mankind, then how could Islamic teaching have anything to do with usurping the rights of others? He asked Huzoor about Taliban and ISIS and Huzoor told him they were misguided and in the wrong. He asked Huzoor’s view on the world situation. Huzoor told him that the world was rapidly getting engulfed in disorder and turmoil. This is not only going on in the Muslim world but Eastern European countries are also heading this way. If patience is not demonstrated if peace efforts are not made then a great calamity can be upon us which would be WW III. This was also mentioned in their news. Our Irish Sadr and missionary-in-charge were also interviewed. Galway FM radio with more than a hundred thousand listeners broadcast it. Irish Times is a national newspaper. It covered our news on three quarters of a page with Huzoor’s photograph and images of the mosque. They had also interviewed Huzoor and published some of his quotes. The readership of this newspaper is 181,000 whereas its online version receives 184,000 hits. While interviewing Huzoor the paper asked what the difference between Ahmadis and other Muslims was. Huzoor explained that the difference was exactly in line with a prophecy of the Holy Prophet (peace and blessings of Allah be on him). Huzoor told them that while the mosque of non-Ahmadi Muslims were full of worshippers they were devoid of guidance. Huzoor told them that ours were not mere words that a reformer was needed and he came and that Khilafat can be established just because someone says so. Huzoor explained that there were heavenly signs accompanying all this like the solar and the lunar eclipses. Overall the media coverage including television, radio and newspapers was good and the Jama’at received positive introduction. Huzoor said wherever we build mosques God facilitates extraordinary opportunities to spread the message of true Islam. Huzoor said it was also a great favour of God that his tours abroad were extraordinarily blessed by God. All these blessings open new avenues of Tabligh and introduction of Jama’at in accordance with the promises God made to the Promised Messiah (on whom be peace). Our effort is very small but it receives boundless grace and bounty of God which further strengthens the faith of each Ahmadi. Huzoor said people still ask this question today but God’s help and support is with the Promised Messiah (on whom be peace) which they do not want to see. Their so-called leaders have pulled wool over their eyes in such a way that rather than reach out for light they are looking for darkness. They are experiencing Divine displeasure again and again but do not care. Natural disasters, the pitifully state of the Muslim world and the murder and mayhem does not make them ponder as to what is happening to them! Are they recipients of Divine blessings and thus also attracting the world to the blessings or are they repelling the world? May God make them get out of the snare of the so-called, self-serving leaders and practice the true teaching of Islam and accept the Imam who was sent by God! They continue to martyr our people but do they get any inner peace by martyring one Ahmadi? If not daily then weekly hundreds of their own are being killed! There is turmoil and restlessness everywhere in Pakistan. Huzoor prayed that may God also enable us to discharge our obligations well. Huzoor said today again he will lead funeral Prayer of a martyr. He said he would also lead a present funeral and yet another funeral in absentia. The present funeral was that of Dr Rubina Karim Sahiba, wife of Dr Abdul Monim Sahib of Ireland who passed away on 27 September. She came to Ireland in 2000 and served Lajna in various capacities. From 2009 till her death she served as naib sadr of east region, Ireland. For years Friday Prayers were offered at their home. She was a most hospitable person who was regular in offering her Prayers, was prayerful and sociable. She had a very patient and grateful nature and was at the forefront of financial sacrifices. She was a very virtuous, sincere lady. She had suffered from cancer for quite a while but had remained extremely steadfast. Showing great courage she had gone to see Huzoor. Her only concern was for her young children growing up in this environment and asked for Huzoor’s prayers. She could not attend the inauguration ceremony of Maryam Mosque and died the next day. She leaves behind her husband and two sons who are Waqfe Nau children. Dr Mubasher Ahmad Khosa Shaheed was martyred in Mir Pur Khas, Pakistan on 22 September. He practiced homeopathy from his clinic where two unknown men came on a motorbike. One of them went inside the clinic and shot five or six bullet at Shaheed on his head and chest and he was martyred on the scene. Shaheed’s family hailed from Dera Ghazi Khan and his father also had to endure persecution for being an Ahmadi. Khosa Sahib Shaheed moved to Mir Pur Khas in 1995 and set up his clinic. God granted him great healing power and feudal lords of the area came to him for treatment. Everyone in the area knew Shaheed was an Ahmadi but there was no opposition. So much so that the Imam of a mosque adjacent to his clinic did not ever say anything against the Jama’at and was on good terms with Shaheed. Huzoor said with the grace of God there are still some Maulawi Sahib with decency in Pakistan, my God further guide them. Shaheed served the Jama’at in many capacities and was very keen to serve others (Khidmat e Khalq) and was at the forefront when it came to making sacrifices. He was of simple nature and had an ardent love for Khilafat. He was a softly spoken man who was fervent in obedience and was dignified. He gave up his habit of chewing paan (a betel leaf preparation) because he felt it hindered his invocation of Durud Sharif. He was a Moosi and leaves behind his parents, wife, two daughters and two sons. Both his daughters are medical students. May God be the Helper of his family and fulfil the wishes he had for his children. Al Hajja Sister Naima Latif wife of Al Haaj Jalal ud Din Latif, Sadr of Zion Jama’at and Naib Ameer of USA passed away on 23 September after an illness. She was born in 1939 to a Christian family and was educated at West Virginia University. She worked as a volunteer in the medical department of USA military. She accepted Ahmadiyyat Islam in 1974 and developed in faith very swiftly through personal study so much so that when she met Hazrat Khalifatul Masih IV (may Allah have mercy on him) at Jalsa Salana UK in 2000 he remarked that it appeared as if she was a born Ahmadi Muslim. Sister Naima Latif did not ever miss Friday Prayers and was regular in attending Jama’at programmes. She never missed fasting in Ramadan and in line of Sunnah kept optional fast every week. She also had experience to perform I’tikaf. She was at the forefront of serving others and always provided lift/ride to the elderly and the infirm who could not go to the mosque. She performed Hajj with her husband in 2002. Sister Naima made her children take leave from school to attend Friday Prayers and promoted the practice of recitation of Holy Qur’an after Fajr Prayer in her family. Neighbourhood children used to join her children during Maghrib Prayer. Sister Naima Latif was at the forefront of making financial sacrifice. She would give any jewellery that her husband bought her as a gift to the mosque and in later life she told her husband that since she donated all the jewellery he bought her, rather than buy her gifts he should directly donate to the mosque fund. She had a very obliging nature and hated back-biting. If she ever heard any woman say something negative about someone she would openly say she did not wish to eat anyone’s flesh. No one dared back bite in her presence. Huzoor remarked if only all our women as well as men adopted this way many of our problems and rifts would be resolved. Sister Naima Latif had an ardent love of Khilafat. She promptly adopted hijab after listening to an address by Hazrat Khalifatul Masih III (may Allah have mercy on him) on the significance of purdah! At the time she was the only woman in her area who wore Islamic hijab. She regularly wrote Huzoor for prayers and whenever she came for Jalsa, she met Huzoor and had a connection of extreme devotion. She served national Lajna USA in many capacities and was a Moosia. She leaves behind her husband Jalal ud Din Latif Sahib, one daughter and three sons. Her family is very sincere and devoted to the Jama’at, perhaps her daughter is more enhanced in sincerity than the others as she comes for Jalsa Salana UK every year. May God elevate the status of Sister Naima Latif, may He forgive her and keep her in His loving grace. May He grant steadfastness to her family and always remove their difficulties!